Connor Webb and his mother, Kim Webb, stand outside of their home in Huntington Beach, Calif. Connor was treated for a rare cancer at 16. He's well now but his mother is fighting for new cures in case the cancer comes back. Whenever she asked doctors about the lump on her son's right thumb, Kim Webb heard a similar response: "No big deal. Just take care of it whenever." Last January — after the lump had doubled in size, prompting surgery to remove it — the doctor phoned Sunday evening with a diagnosis: epithelioid sarcoma, a slow-growing soft-tissue cancer. "It was the worst day of my life," said Webb, a mother of two in Huntington Beach, California. "I just sat in my car and cried and cried in disbelief." After a blur of tests and scans during the month after diagnosis, Webb's 16-year-old, Connor, went in for another surgery — this time for full resection of the tumor plus a bit of surrounding tissue to prevent recurrence. He regained full use of his thumb, and as of this July, CT and MRI scans show no evidence of disease. "We are very fortunate," Webb says. But epithelioid sarcoma has an ugly secret. This cancer often comes back later — even decades later. And when it returns, it grows aggressively and there are no drugs to stop it. Webb realized she needed to keep looking for a cure. "We're never in the clear," she says. Epithelioid sarcoma is exceedingly rare — estimates vary but at most, no more than around 100 cases per year. Of those, 10 percent occur in children and adolescents. For this and many other rare cancers that kids get, it takes a long time to find enough patients to test new therapies. Even worse, small patient numbers mean there's less motivation to allocate resources to study the diseases and develop potential drugs. Dozens of childhood cancers fall in this category, some so rare that few pediatric oncologists hear about them. For families like the Webbs, whose cancers have no approved treatments beyond surgery, radiation and chemotherapy, it can feel like there's next to nothing they can do for their kids. But some of these families have found a new ally in their fight: the Children's Cancer Therapy Development Institute, or cc-TDI, a nonprofit biotech lab that brings families and researchers together to push the field forward. In 2016 the Creating Hope Act introduced incentives for industry to invest in rare childhood diseases. But pediatric cancers offer little payoff for the investment in drug development compared to breast or colon cancer, for example, where patient numbers reach "hundreds of thousands, rather than hundreds," says Jim Geller, an oncologist at Cincinnati Children's Hospital. Because there are so few cases, "trials cannot be conducted quickly, nor can you conduct multiple trials on the same disease as easily as in adult cancer," he says. And so very few new treatments are in the pipeline. This means families can find themselves out of options very quickly when their kids get sick. Since 1978, the Food and Drug Administration has approved just six drugs for children's cancer, while it has approved dozens per year for more common cancers that affect adults. For many families facing rare cancers, there's nothing like sheer desperation to fuel action. Some petition pharmaceutical companies and call doctors around the country begging to try newly approved therapies. Families affected by childhood cancer travel to the cc-TDI lab in Beaverton, Ore., to learn about the research process and how they can partner with scientists and engineers to advance the science in rare pediatric cancers. The Children's Cancer Therapy Development Institute, just outside of Portland, Ore., takes a more coordinated approach, one that is channeling families' desperation to quietly transform pediatric cancer research. In less than three years after the Institute began operating out of a remodeled paint factory in Beaverton, Ore., it has pushed new drug candidates into three clinical trials. The Institute was launched to help fill what founder Dr. Charles Keller calls the "preclinical gap" in childhood cancer research – where potential drugs languish in lab freezers because scientists aren't incentivized to do the laborious experiments needed to translate promising lab findings into viable compounds for drug trials. "All the papers and grants in the world don't mean anything if we can't get drugs into clinical trials," says Keller, an expert on the biology of childhood sarcomas who left his faculty position at Oregon Health & Science University in 2014 to start cc-TDI. "We've used our relationships with families to reboot a broken cycle." The Institute is equipping small armies of parents to help shape the research agenda by sharing what they know from first-hand experience with these diseases. "The more you talk with people, the more you realize they have some insights," says Keller. "They want a way to participate." One way families participate in the work of cc-TDI is by attending its pediatric cancer "nanocourse" – a weeklong crash course offered each summer for families, students and other lay people to learn from world experts, shadow scientists in the lab, collaborate with other participants to brainstorm the road to a cure and publish those plans in peer-reviewed journals. 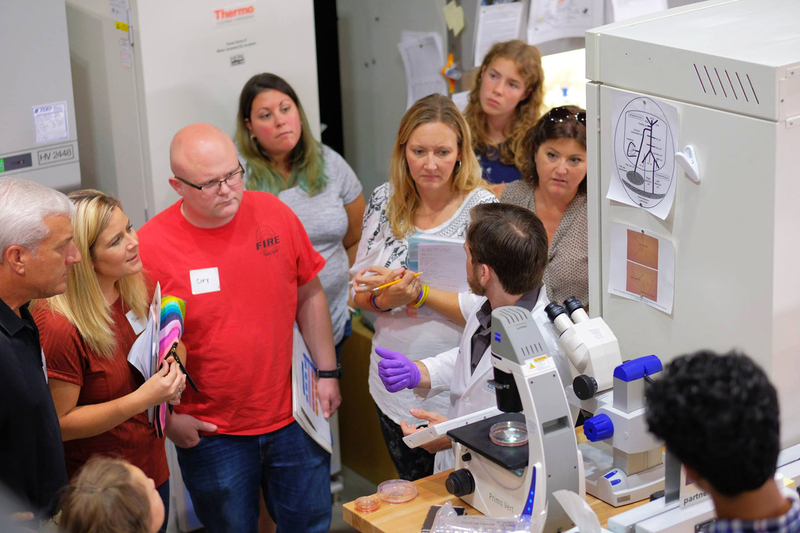 Participants leave the nanocourse equipped to raise funds, educate their communities, and help arrange tumor tissue donations to labs that can create cell cultures and mouse models. The Institute runs its own program, called CuRe-FAST, for families to contribute tumor samples to a registry that scientists around the world can access. The Institute's patient-centric approach combines the rigor of an academic lab with the flexibility of a startup. Instead of depending solely on academic grants which require scientists to apply the funding toward specific research programs, cc-TDI also receives money from foundations and other philanthropic sources that do not carry such restrictions. This allows the research to move nimbly — to "go with what's working and pivot from what's not working," says Keller. And the families that the Institute works with are often key to getting that funding. Only 4 percent of government cancer research funds go toward studying childhood cancers. "A lot of good ideas die in the mind because there are no dollars," says Geller of Cincinnati Children's Hospital. Foundations can help by giving junior scientists pilot funding for a few years of data that will help them compete for larger government grants. 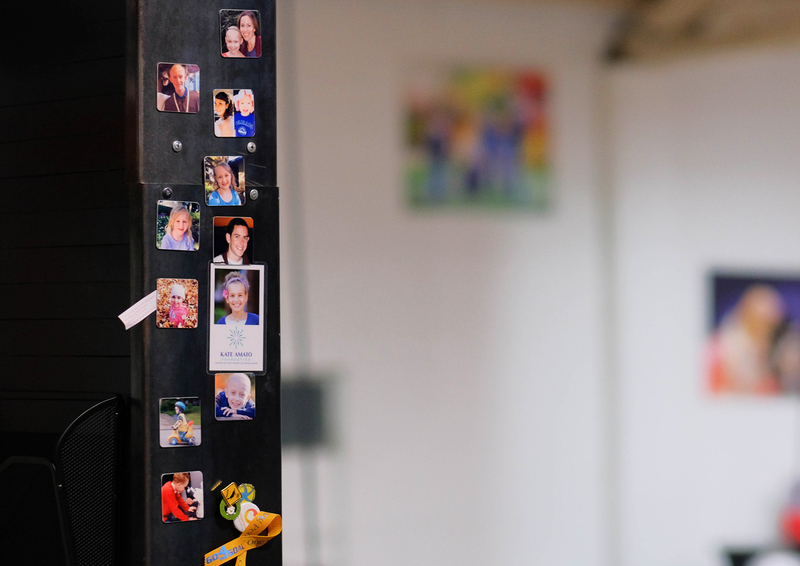 The walls of the cc-TDI lab showcase the kids and families affected by rare cancers and serve as a constant reminder to the scientists about the lives their work can touch. "A lot of foundations are started by parents," says Geller. "And the finances they provide is incredibly meaningful." Last year, more than half of cc-TDI's $1.9 million budget came from foundations. For Webb, attending a course at cc-TDI gave her new knowledge and a new network. Days after the fateful phone call about her son's cancer, desperate for new information, Webb had joined two Facebook groups dedicated to epithelioid sarcoma. "I had to research everything. I needed to understand what was going to help my son. But this isn't my field," says Webb, who hadn't studied science since high school. "And so I'm like, where do I even go?" One of those groups was created by Andy Woods, a Montana tile contractor whose 11-year-old daughter suffered a dire form of Wilms' tumor, a childhood kidney cancer. Woods had become active in researching and sharing information about other rare cancers. Through Facebook messages and a frenzy of texting, he taught Webb a lot and eventually connected her with cc-TDI, where he now works. Webb rallied three other families to join her at this summer's nanocourse, which focused on hepatoblastoma and epithelioid sarcoma (EpS). The EpS families came out of the week equipped to chase a shared mission: better treatments for epithelioid sarcoma, and ultimately a cure. "I learned more about epithelioid sarcoma and other rare cancers in one week at cc-TDI than in the last ~2.5 years since my son's diagnosis," Jill Cook, a mother from central Iowa, wrote in an email. Since the nanocourse, the EpS families have set up a fundraising platform, created a research-focused Facebook group, and are holding weekly conference calls to build a website. Most importantly, they found each other. "All of us were out there by ourselves. How do you conquer something like that — researching a rare cancer — when you're by yourself?" Webb says. "But now, from that course, we're able to form our army. That's the biggest thing." Esther Landhuis is a freelance science journalist in the San Francisco Bay Area. Follow her on Twitter @elandhuis.